Tomatoes are a new thing for me... while I have always loved salsa and tomato sauce, I spent the first 42 years of my life diligently picking tomato pieces or chunks out of any salad, sandwich, In N Out Burger, or taco. Something about the texture always turned me off. In the last few year though, I have been reading about the health benefits of tomatoes, and I started letting those tiny diced pieces on my taco slide by. I even kind of got used to them and almost missed them when they weren't there. Then, once I ate a piece from a salad! Unfortunately it was a winter tomato, white inside, a bit mealy and to me it was just plain... well... for lack of a better word, yucky. That set me back a few years. Last year at my Carlsbad Farmer's Market the man who owns the fields near us offered me a slice of a fresh heirloom tomato. I have to say his display was beautiful with it's abundant yellow, green, orange, red, and striped tomatoes. I really wanted to like them, but I was so sure that I wouldn't. His were simply cut into chunks, drizzled with a bit of balsamic and dusted with a touch of salt and pepper. With no easy way to say no without offending him I searched out the smallest piece that I could find and quickly popped it into my mouth fully expecting to completely dislike the texture and find that funky "tin like" taste that I had come to associate with some tomatoes. The flavor that exploded in my mouth with this bite was absolutely nothing like I had come to expect! The texture was not even remotely mealy, just fleshy and firm, but not too firm. Wow! The flavor was so amazing that I actually found myself reaching for a second piece, and then actually purchasing my first 3 heirloom tomatoes. Since then I have come to realize that there are good tomatoes and bad tomatoes. To me, "bad" (insert: soft, mushy, mealy, yucky here!) tomatoes are just plain not worth eating. I am now in my second summer of loving these luscious heirlooms and have searched for and pulled many wonderful recipes from magazines and web searches. 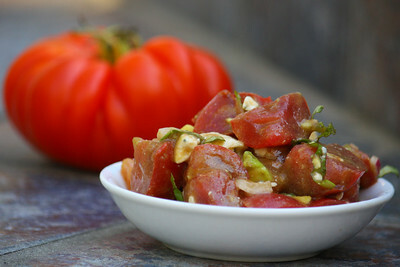 I have even shared a recipe with the vendor at the market and become one of his biggest heirloom tomato cheerleaders! Last week the much awaited fruits made their anticipated arrival and I purchase no less that 10 of the brightly colored globes. They have been added to sandwiches, sauces and last night to the Heirloom Tomato Salad with Blue Cheese. My husband laughed as I fully enjoyed this salad made mostly with tomatoes and commented that he remembered when I wouldn't eat just one in a salad, let alone a whole bowlful on my own! This recipe comes from Epicurious and I adapted it to suit my tastes and ingredients on hand. It is a definite keeper, and as one reviewer said, "this is the reason to plant your own tomatoes!" The ingredients are simple and for the most part would be what you have on hand. Fresh basil from our garden was sliced and sprinkled on top, and my husband commented that he found himself looking for even more, so I will increase the basil even more next time. Overall, an excellent summer salad! Add tomatoes, onions, avocado and blue cheese to a bowl and stir gently to combine. Add olive oil, vinegar, basil, and salt and pepper, stirring again to combine. This salad would be wonderful over a plate of fresh greens or atop some toasted, crusty bread! I love tomato salad!!! and your heirlooms look incredible! we just don't see them often around here. We are so lucky to have an heirloom field growing just around the corner, one of the few open areas around here. I'm still trying to figure foodbuzz out! That's a cool story! I haven't always loved fresh tomatoes the way I do now. I'm pretty picky too - and I really dislike the seeds. And I love your salad - everything in it screams delicious along with summer! Thanks for linking it to the Showdown! Cinnamon-Girl, I completely agree about the seeds! Thanks back to you for doing the Showdown. I just discovered it and enjoyed looking at the other recipes. Beautiful photos and beautiful salad. It looks so delicious and refreshing. Perfect for the hot weather. Thanks for sharing. NOM NOM NOM! This looks so yummy and so beautiful! Tanks you both. This has indeed become one of our summer favorites! What a gorgeous tomato salad! The colors are uber-rich! Heirloom tomatoes are some of the most beautiful fruits around! 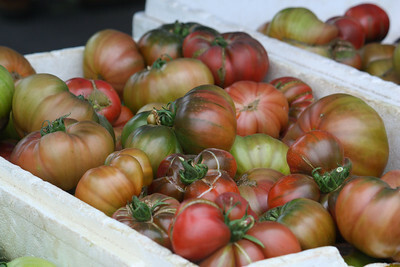 I love the variations in colors of the tomatoes! We haven't had too many at the market this year, but I know the orange and yellows are coming.